The Province of Bicol, Philippines is very rich and blessed with a lot of well grown coconut trees; they popularized the method of cooking food in coconut milk and chili. The Province of Bicol, Philippines is very rich and blessed with a lot of well grown coconut trees; they popularized the method of cooking food in coconut milk and chili. 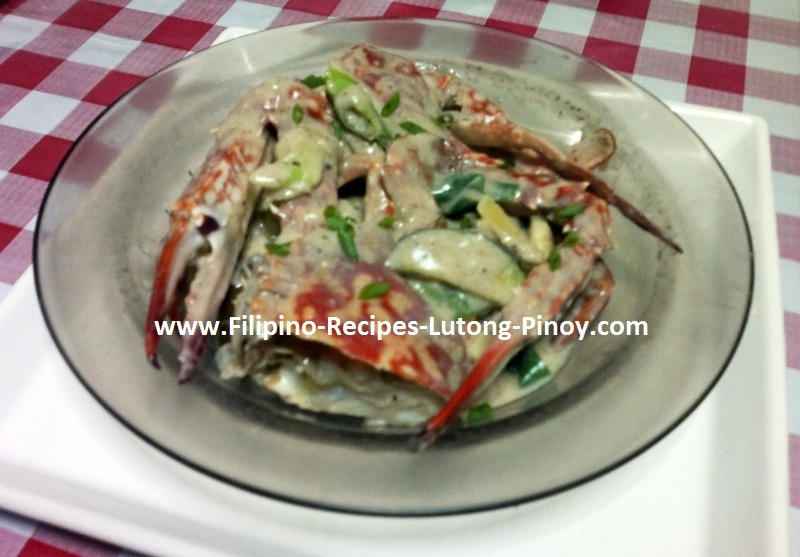 This dish is very well known all over the Philippines because of the delicious and great combination of coconut milk, crab and chili. The thickness, the creaminess and the oil from the coconut makes this dish more delicious. Add more vegetables to make this dish more colorful and flavorful like string beans, squash, malunggay and unripe jackfruit. 1. Extract the grated coconut; for the first extraction, put the grated coconut in a clean cloth and squeeze directly to a bowl. Set aside. For the second extraction, Add warm water into the squeezed grated coconut, use your hands and press the grated coconut until the milk comes out. Strain. 2. In a large deep pan over a medium high heat. Pour in the second extract coconut milk; bring to a boil. Add onion, garlic and ginger cook for about 2 minutes until soft. Add aligue or the crab fat, stirring constantly until all the flavors are well distributed. 3. Lower the heat, stir-in the crabs. Sauté the crabs until they turn light red for about 5 to 8 minutes. 4. Pour in the first squeezed coconut milk, bring to a boil. Add lemon grass and cook for about 20 minutes. Season with salt and pepper. Add the chili pepper. 5. Stir-in the eggplant and add the oyster sauce. Cook for another 2 minutes until the crab cook through and crab absorb all the flavors. Add green onions and the chili leaves. Cover the pan and turn off the heat. Serve.